The Catholic Archbishop of Lagos, Most Rev. Adewale Martins on Sunday urged Christians to live peaceful and humble lives as taught by Jesus Christ’s symbolic entry into Jerusalem. Martins made the appeal while delivering a sermon at the Holy Cross Cathedral in Obalende, Lagos, to celebrate this year’s Palm Sunday. 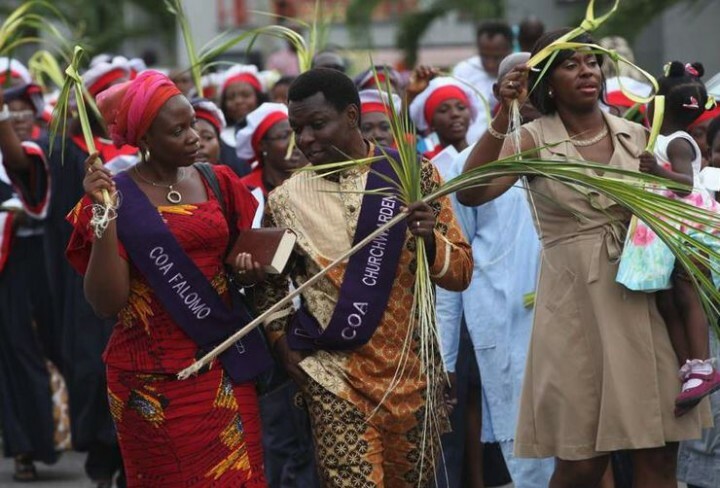 The News Agency of Nigeria (NAN) reports that Christians celebrate the event every Sunday preceding Easter in remembrance of Jesus Christ’s triumphant entry into Jerusalem. He urged Christians to always conduct themselves peacefully as Christ’s followers. Martins said that Jesus Christ entered Jerusalem as the Prince of Peace and not a war-waging king. “Palm Sunday is marked with the distribution of palm leaves, often tied into crosses to the assembled worshippers. “Jesus’ triumphant entry into Jerusalem on a donkey is depicted in an early 1900’s Bible card illustration. “The church re-enacts or celebrates Christ’s entrance into Jerusalem to accomplish His paschal mystery. Jesus’ triumphant entry into Jerusalem was recorded in the four gospels. “Jesus rode a donkey into Jerusalem; the celebrating people spread their cloaks on the road while others cut branches from palm trees and spread them on the road,’’ he explained. The Director of Social Communication, Catholic Archdiocese of Lagos, Msgr. Gabriel Osu, told NAN after the service that Palm Sunday was a call for everyone to follow the spiritual path as Christ did. According to him, if we are not willing to acknowledge sin as sin, and just ignore it, we are stuck outside the door of God’s mercy. “There will be a day when every knee will bow and every tongue confesses that Jesus Christ is Lord. “The Jews of course expected a literal king to restore the kingdom of Israel, not realising that his kingdom was spiritual — his kingdom on earth is the church. “Let us examine two major symbols, starting with the donkey. The donkey represents the lowest natural desires of any person. “What this means is that for one to enter the house of God, one must subordinate one’s natural desires to that of God by repenting of our sins. “Palm trees were used in rituals from ancient times. It was one of the trees used in the Jewish feast of tabernacles. “The palm tree signifies a spiritual affection for the truth. It means living the truth of the word of God,’’ he told NAN. He said that for the over two billion Christians across the globe, including himself, the day, Palm Sunday, was a very special one for all. “It is very special for the following reasons. It is the day we celebrate the triumphant entry of Jesus into Jerusalem, one week before His resurrection. He said that Palm Sunday began with Jesus and His disciples travelling over the Mount of Olives. Also speaking, the Parish Priest of Saint Timothy and Titus Catholic Church, Isheri, Rev. Fr. Kelvin Okuoma, urged leaders in the country to emulate Jesus Christ’s teachings of service and humility. “Jesus showed humility even unto death for the benefit of humanity, not minding he was mocked and shamed, he still asked God to forgive those who tortured and killed him. He said that the triumphant entry of Christ into Jerusalem which led to the festival of Easter showed that when Nigerians believed in Him, they would be victorious no matter the obstacles. “This week is considered the most holy of all the weeks during the church year; Christians should deeply ponder on the death and resurrection of Jesus Christ during this sacred period. “If we cannot forgive those who offended us and make peace with them, our prayers and fasting during this Lenten period will be meaningless and useless,’’ he said. At the St. Joseph Catholic Church, Gowon Estate, Ipaja, Rev. Fr. Sebastian Akponan, urged Christians to show forgiveness to one another, just as Christ forgives those who tortured and killed him.